The all-in-one Avocent SwitchView (2SVPUA20-001) multimedia desktop 2-port KVM switch lets you switch between USB or PS/2 systems, share your USB devices and control multimedia applications. 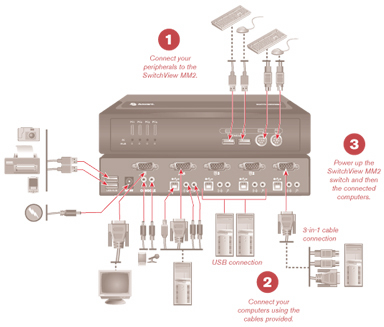 The Avocent SwitchView (2SVPUA20-001) MM2 model provides independent switching for KVM and two USB 2.0 hub ports. With the Avocent SwitchView (2SVPUA20-001) multimedia KVM switch, you can use one compact device to control multiple PCs and share access to your USB devices; digital camera, CD ROM, PDA, scanner or printer. Question: One computer is 75' away connected with long vga, audio and usb cables, will this work. Question: I currently have a keyboard and trackball connected to a powered USB hub and then sent 30 ft to a PC. It works fine. I want to now use that same keyboard and trackball and use it o a second PC located next to the first. Can I connect my Key/Trackball to this KVM, use the single USB cable I am currently using to connect to the single PC and use it to connect the two KVM units? Answer: Thank you for your inquiry. Unfortunately, the answer really depends on the specific set up and hardware involved. You might be able to plug the keyboard and trackball into the KVM, and then run 2 separate USB cables for the computers (you would need two cables, so that each computer was plugged into its own port/channel). Again, depending on the setup and hardware involved, you may be able to plug both computers into the KVM, then run the USB hub out the 30' to the keyboard and trackball (this solution my cause issues with hotkey switching and keyboard/mouse emulation). Neither option addresses the VGA/audio input (if you need that capability). Depending on your particular needs, the best solution might be a KVM extender: https://www.kvm-switches-online.com/kvm-extenders.html . If you would like to discuss the different options, please give us a call at 1-877-586-6654. Question: I need a KVM switch a resolution of 2560 X 1080, where can i fnd it? Answer: Than you for your inquiry. One dual-link DVI KVM that has a max resolution of 2560 x 1600 @ 60Hz (using dual Link DVI) is the Aten CS1782A (). Other KVMs may fit the bill depending on your particular requirements. Please call us at 1-877-586-6654 or contact us via out online chat feature to discuss your project in greater detail.